Ever wonder how to cut a stencil with your Silhouette that’s bigger than your machine? 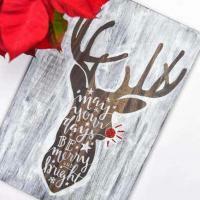 Check out how I did it with this Hand Lettered Rudolph Craft! I turn into Buddy the Elf at 12am on November 1st and stay that way until New Years Day. I just can’t don’t want to turn it off. To me, nothing says Christmas like the old-school classic Christmas movies. As a kid I used to love cuddling on the couch under a soft blanket, the coal stove blasting heat in the background and sipping on a mug of hot chocolate while a Christmas movie played on the tv. My favorites were always Frosty and Rudolph, and I could watch them over and over and never get tired of them. When it comes to Christmas decorations, I love making my own. I’ve gone all out the past couple of years and it’s been really fun. Lots of it is themed (like all my Harry Potter Ornaments) but I have some that are regular old Christmas decorations, like this Hand Lettered Rudolph Craft that I absolutely adore! I kind of jumped on to the bandwagon a few years back and fell in love with calligraphy (like the rest of the world). I’ve been trying to teach myself how to do it but it’s hard. I have so much respect for anyone who does it and does it well. And since everyone I know is into calligraphy and all things handmade right now I wanted to find the perfect hand drawn file to use for this project. Etsy has become one of my favorite places to find unique files, and that’s exactly where I found the reindeer! I ended up loving the shop owners work so much that I bought multiple files to decorate our home with. How to make your own Hand Lettered Rudolph Craft! See how easy it is to make a stencil that is larger than your 12x12 Silhouette Cameo mat! PART ONE: How to prep your wood and cut the svg file bigger than your machine! Stain your piece of wood and set it to the side while it dries. Download your Reindeer design from TheSmudgeFactoryLLC. If you own the Silhouette Portrait you can only cut designs as wide as 10 inches. Go ahead and size your design so that it's as wide as your cutting mat. If you are using a Silhouette Cameo, skip to step 6. Because the wood is much larger than the Silhouette Portrait cutting mat (and machine for that matter), I had to cut my design into three pieces so that it would fit on my wooden canvas. To do this, I used the slice tool and cut the antlers off of the reindeer. I then moved the face of the reindeer off my cutting mat and sent the antlers to cut. Next, send the body of the reindeer to cut. 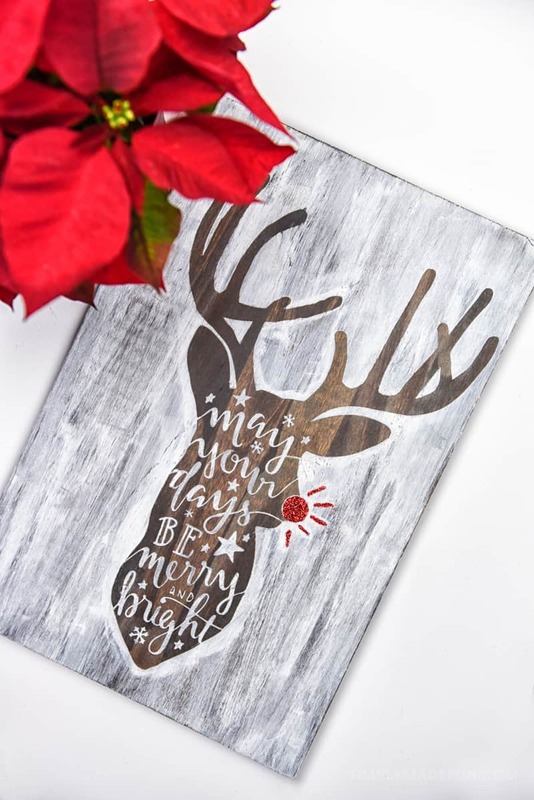 PART TWO: How to piece your Hand Lettered Rudolph Craft stencil together and get the white washed paint look on your wood! Once both of your pieces are cut put a piece of transfer paper on top and piece the the three pieces together. You can see in the above picture where the ears and antlers have a small space in-between the face. 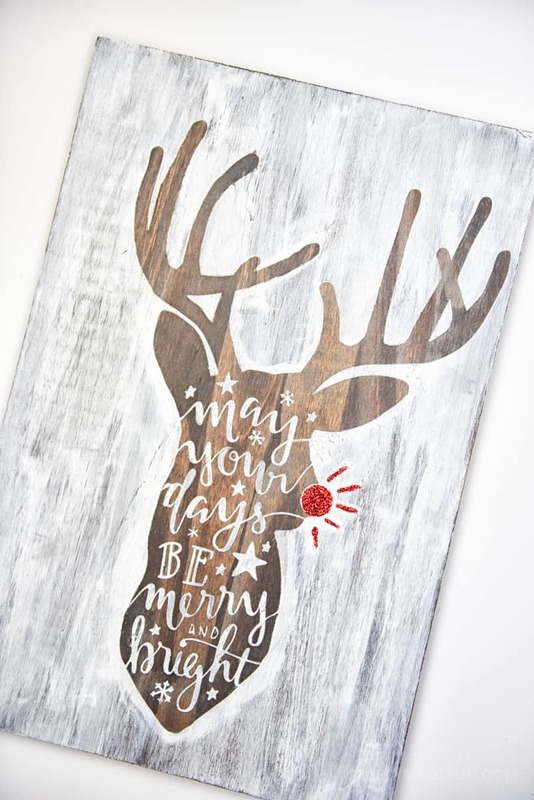 Next, paint a very light layer of mod podge over the Hand Lettered Reindeer craft. This keeps the paint from leaking under your stencil. Mix some water and your white paint (1 part paint, 1 part water) and brush it onto your wood. Use a spare rag to wipe the excess paint/water away. You do not have to wait for the paint to be fully dry before pulling up your stencil! Once everything is dry paint a light layer of polycrylic over the entire board to seal it. Next, take a little bit of glue and put it over Rudolph's nose and the the four "beams of light" coming from it. Then pour red glitter on top until every piece is covered. I poured the excess glitter into the trash can (I didn't have much left over!). If you have to cut your design in pieces, make sure you select your design and hit "Make Compound Path". Otherwise when you go to cut it the design will cut in a dozen small pieces. You do not want to waste your stencil material! Make it a homemade holiday and do some crafts with the kids to make a really fun and personalized display. Join us for monthly chats about everything creative and fun in our newsletter + grab the FREE mac + pc keyboard shortcut guide for Silhouette users! Yay! Thanks for joining us! You're almost ready to start knocking out projects in no time at all. All you have to do is confirm your email and you'll get the free download. Are you ready to stop wasting time? Can I ask what type of white paint you used? Is it just an acrylic craft paint? Hi Val! I believe I used chalk paint for this craft, but you can use acrylic as long as you water it down a bit so it’s easy to spread on the wood! Oh and by the way, I love it ! !